Which autotiles are we using, and what order do they go in? I'm getting weird results when I copy the order from "outdoor tileset." Also, how about a long-term solution? The autotiles should be the same as are used in the Pokestarter kit. Route 201 also has road blocks around the stones in the river. Use the ones from pokessential's outdoor waterfall one, I do. Ok, 201 is fine now, but Neo Bay is coated in snow or something snow-like. Edit: It's actually "Waterfall Bottom." Last edited by Cyndadile; 08-04-12 at 12:51 AM. I've started on Enechestra, but it might take a while. Edit: And I have no idea how to upload my first draft. Last edited by Cyndadile; 08-05-12 at 12:14 AM. Screenshot the drafts. 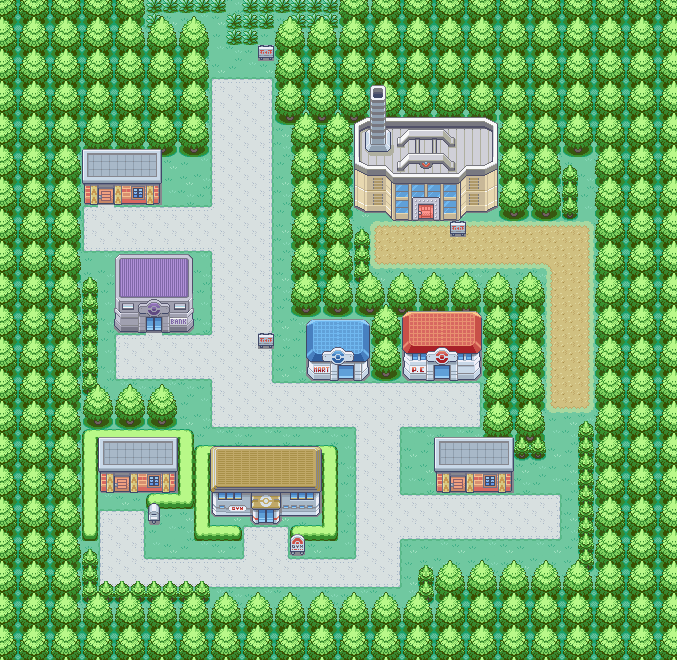 When you have a final, upload the corresponding map file in the "data" folder of Pokestarter. And yes I need to update my version. I'll get back to you on that. What do more experienced people think? Also, for some reason I can't find my map in the data folder. Eurgh, no. Nononono. No gyms on random outcrops. If you want, try seperating the beach and town/xity by a single 'cliff'. It'll make it seem less open and give the beach a more defined border. The problem with the cliff border is that it will really minimize the player's ability to move between them. Stairs can only go up and to the north. 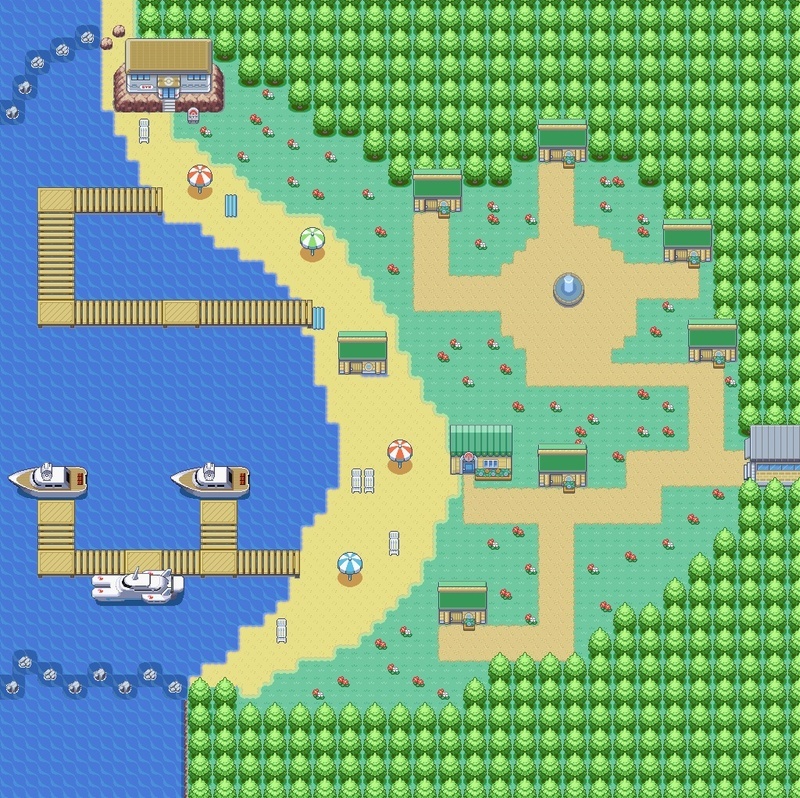 So, it works fo towns with beaches in the south, like Slateport in Hoenn. The only city with a sideways beach separated by cliffs has a very small beach. Enechestra is a tourist location. Tourists like beaches. 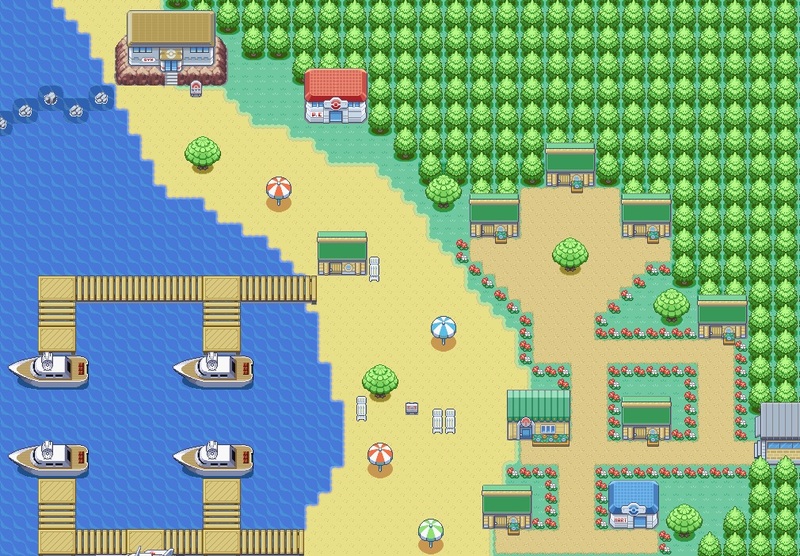 So, the beach needs to be integrated into the town. As for the gym, the gym leader is supposed to be the leader of the town, so I wanted the gym to stand out. I can easily take it off the rock. On the other hand, another reading of the description indicates that Enechestra is known for both its beaches and rock formations, so it might make sense to surround it with cliffs. If I do that, would the gym's placement be acceptable? 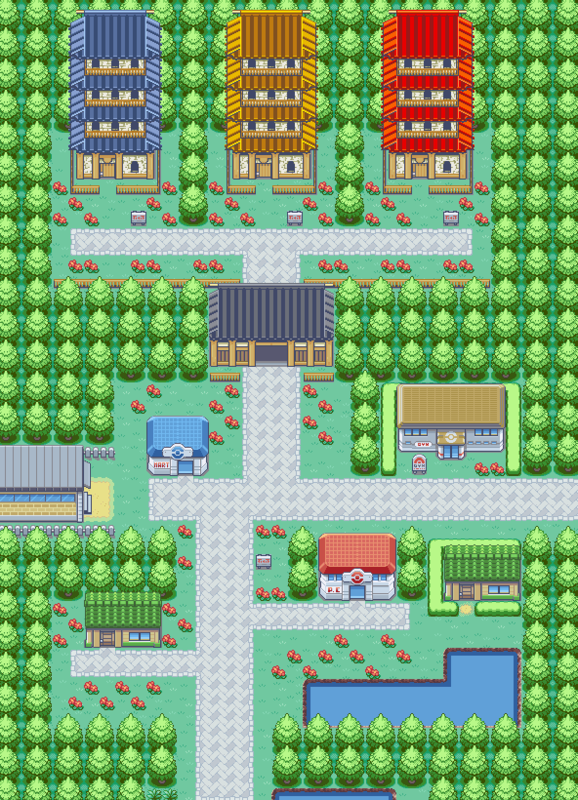 I'll also have to add some pretty rocks throughout the town. I actually agree with BTG here. Cities are infinitely more interesting when you add a bit of depth to them by giving them a layer or two to work with. You can always put stairs going vertically and a jumpable ledge going horizontally. Finally, the grass between the road and the beach is thin and emaciated looking, thickening it will smooth the transition. I'm also not sure about the flower-lined paths. Maybe if you added some additional flowers randomly it might look more natural. As is I kind of like the first layout better since the roads are better defined and because I like the fountain. Keep rock formations on the beach if possible. I can see how this can turn into Enechestra though, so good job on that! The issue with the fountain is the animation. It is incredibly slow, and I'm not sure how to fix it. It takes about a second for that lighter ring of water to go from the top of the fountain to the bottom. If we made an event for the fountain, we might be able to solve that. I tried putting some cliffs on the edges, and I think it looks nice. I'll work on adding depth to the town next. I kinda don't like those houses and the gym being directly adjacent to the cliffs. Could you either move them about one or two pixels away from the cliff face/edge? I don't think any normal person would want to build their building that close to a cliff. Anyone want to put together second floors for two of the houses in Neo Bay? In the city, there are three houses with second floors. One is the player's house, the other two still don't have second floors. We just need the second floor part, no need to add stairs in the first floor. That's easy enough to do. I believe that both will be in your rivals' houses. Also, Sunset needs 3 one-story interiors. Softwind and Cranewing need a few interiors as well. Do we have Softwind mapped yet? I'll do the Neo Bay second floors tonight when I have a spare moment. Last edited by Will; 08-09-12 at 08:45 PM. All of Softwind's interiors should be done. I think Will remapped a lot of them and I have a couple hanging around somewhere. Here were the Softwind and Sunset houses. Someone want to recreate them? I'll do some of them but some help would be nice. On it. 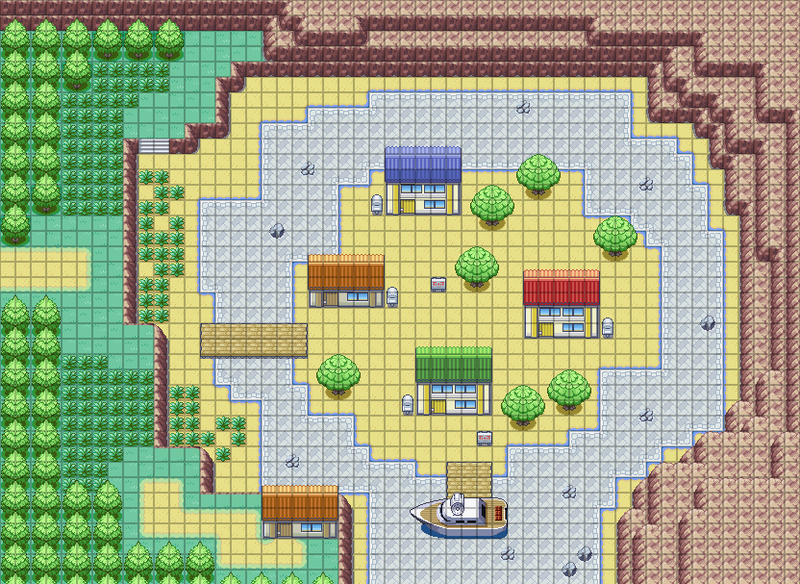 Already had a pokecentre done up (and might have uploaded it), but I can't remember, I'll dig it out regardless. Hey guys. Guess who's back? ... and also now taking development seriously. Been looking into the Essentials docs and I'm really starting to grasp how everything works. With STT's title screen track. Sounds fantastic. Let me know what you guys think. I'm excited to be back. Well hello there! We're excited to have you back! But you may not need that. If you could PM me an email address, that'd be fantastic, and I'll give you access to what we've gotten done in your absence (a fair amount of menial stuff, IIRC). Perhaps we can get our stuff together with whatever you've got there and have them make a mutant Topaz-baby. You might also want to chat with BTG, who was working on moves/abilities-type-stuff. I think all the important information is in that sketchy thread in the last paragraph. Welcome back Triumph! It's great to have you back on board. Just tell us what you need once you've taken a look at the stuff in the dropbox, and we'll try to get it for you as quickly as possible! (This includes using editor.exe to do menial things you don't want to do). 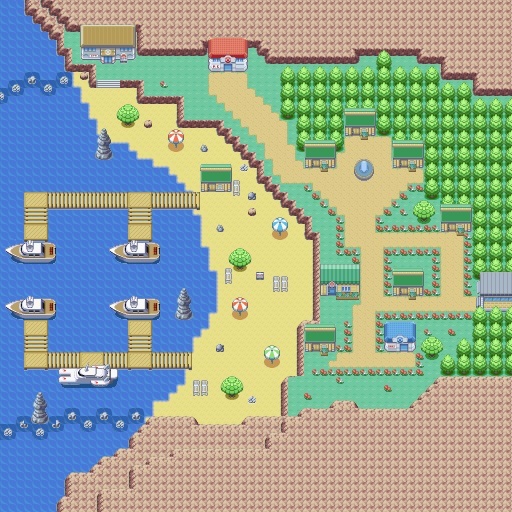 Just ran the game and Neo Bay looks good. Unfortunately I cannot open the project file though... RPG maker is complaining about it being from an older version. Oof. Could you make a new project file and just copy over the map files then? 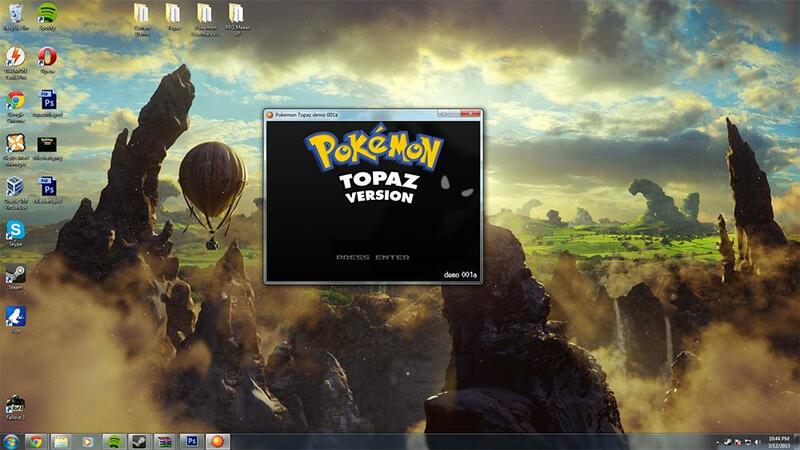 Also pokemon.txt, items.txt, abilities.txt and moves.txt. We'll probably need someone (BTG preferably, but Cyndadile or I might be able to do it) to grab the moves scripts from the project file. Done. Folder called "Triumph's Combo"
Awesome. Can you tell me what version of RMXP you're using so that we can access the file for mapping/scripting if needed? (This includes using editor.exe to do menial things you don't want to do). @BF I cannot animate for shizz so any help is appreciated. Move animations are a luxury. I don't think any other Pokemon fangame has done them. If someone wants to do them, go ahead. I'm also game to help out. But the fact that not only do we have to animate all our moves but we also have to animate most of the canon moves as well makes me think maybe it's just not meant to be. I think the animations are a big part of the battle experience though. Oh well, it's not a huge priority but it would definitely be nice to have. I agree. It's just an absolute insane amount of work. We need to rip the move animations from ROMs since Spriter's Resource is incomplete. My Cherry Bomb animation itself took like 45 minutes to make (of course I had an issue where my work was lost because of a crash but you do have to account for those things) and basically no animations are done, including canon ones, which comprise a HUGE amount of moves. It's just not practical unless there is someone who really wants to commit to doing it as their thing. I think we've said in the past that it was a post-demo thing anyway. Though it's an important luxury to have if we're making a list of them, I wouldn't worry too much about it right now.